damage by trying to remove it from the case. can do to correct this issue, would you let me know? I would be most grateful for your support. I am wondering, does your jackpot payout as expected on 3 Bell Fruit? You need to show a picture of the mech to see if you have the correct trip lever for the jackpot. Yes, it pays properly. The payout has to do entirely with the payout fingers and slides. It's possible one of your slide springs has either too much tension, or not enough. The fingers align with the holes on the reel discs, and there is a combination of those that determine the payout. There's a number of actors involved in correct payout, the most common problem being that the slides were lubricated; they need to be bone-dry. Looking at your picture, the upper part of the jackpot is not there because this machine is a hand load jackpot which means you put the coins in thru the round lock in the area of the award card. The lock is a plug type and that when removed opens to allow the feeding of coins directly into the jackpot. Now as to your problem with the jackpot not paying, have you tried to lift up the trip lever on the left side of the jackpot? 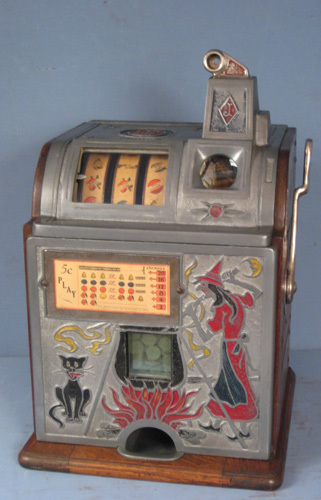 Try manually tripping the jackpot and check the front of the machine to see if the lower jackpot door opens. I am working on a machine that sat for years and the lower jackpot door is stuck shut. The only solution if this is the case is to remover the jackpot by unscrewing the top screw and the left and right screw at the bottom of the jackpot. You then have to take the jackpot of of the machine and remove and clean the lower door so that is swings freely and opens when the jackpot is tripped. In order to remove the jackpot you need a flat blade screwdriver about 15 inches in length. You will also need a flashlight to see the position of the three screws. Yes it is a little tricky especially when you reinstall the jackpot you have to be careful not to cross thread the bottom screw especially the one on the left above the handle pump. YES! my machine has a hand / front load jackpot. Can you tell and/or show me exactly where the trip lever on the left side of the jackpot is located? Once manually tripped, will it reset itself? I appreciate your time, clarity, and support. As asking before , no photos of the mechanism , no solutions !! Send a photo of the front mechanism (global and arround the coin slides!) and you will certainly received more help ! Thank you, Stephane, for your clear response. Posting mechanism photos is on my to do list and will likely happen over the weekend. Attached are what I hope are relevant photos so I can get some advice on setting and/or testing my Mills Black Beauty (frontload) jackpot. Also, I regret some of the photos are not orienting properly online. However, once you click on an image, this issue does correct itself. Thank you so much for your time, patience, and expertise in this matter.